Restaurant review of The Public House in downtown Chattanooga. When my daughter came in town for mother’s day weekend, we knew a trip to Anthropologie was in order. The only question after that was were to eat. We decided to try Public House which was located at Warehouse Row. It was the Saturday before mother’s day, but it was early (5-ish), so we hoped we could get a table. While there was nothing inside, there were some tables available outside. Our first decision was cocktails. My husband had a beer, my daughter ordered the Rookie in a China Shop and I ordered Public Knowledge. The Rookie in a China Shop was made with Chattanooga Whiskey and ginger beer. It was a nice sipping cocktail. 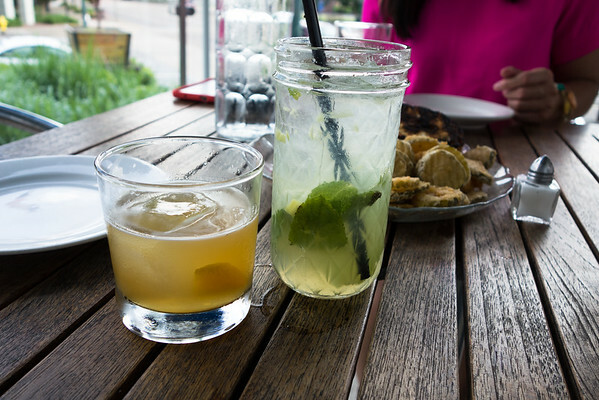 My Public Knowledge was wonderful – it was made with pineapple infused gin, lemonade and mint. Refreshing and delicious! 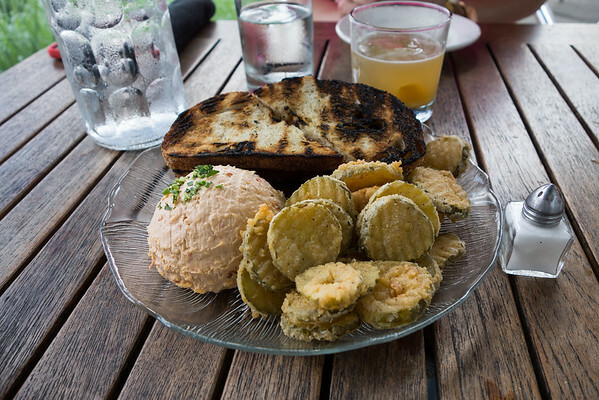 Since it was a special occasion (my husband’s birthday, my birthday and mother’s day are all within a week of each other), we ordered an appetizer – The Grilled Sourdough, Pimento Cheese and Fried Pickles. It was wonderful. The portions were generous and it easily fed us three. This was so good, I could get it for my whole meal and be completely satisfied. My fried chicken was not one of my favorites. The breading was a little heavy and weirdly sweet. The chicken however was super moist and was delicious dipped in the sauce. The mac and cheese was good. 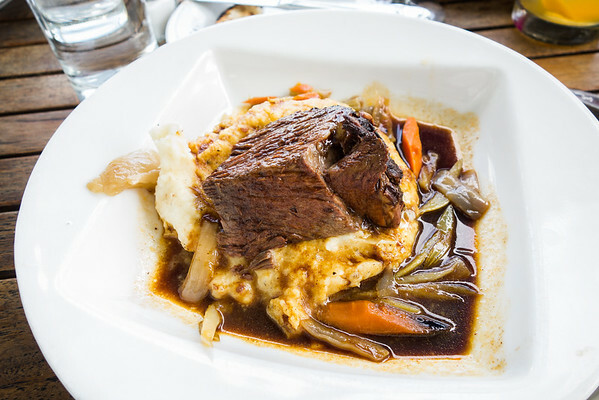 My husband’s red wine braised pot roast was amazing. It was tender and the braising liquid was incredibly flavorful. 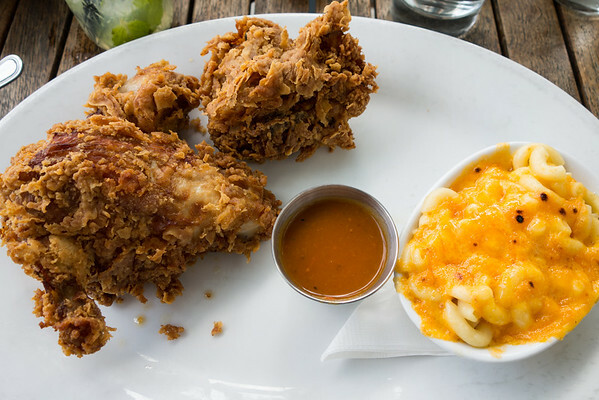 Total comfort food and totally delicious! Perhaps the most disappointing dish was the Grilled Fundy Salmon with Asparagus and an Egg and Olive Vinaigrette. 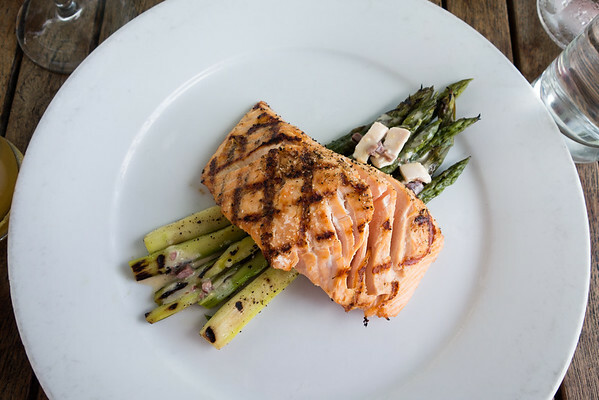 The salmon was cooked perfectly, however the asparagus and vinaigrette lacked flavor and vibrancy. A few squeezes of lime might have perked it up a bit. Our waiter was excellent and the service was friendly. Overall there were a few misses, but the hits were so good, they totally made up for any disappointments. I think the key is trying a few things and finding your favorites. We will definitely be back, there’s a duck confit and a trout dish that are definitely calling to me. There’s not one thing in this post that isn’t fabulous looking!